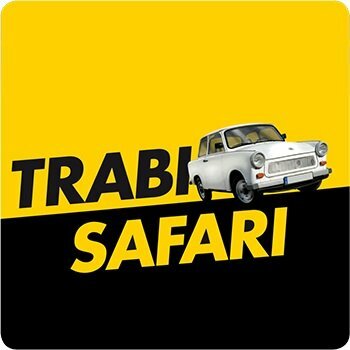 Explore Berlin’s urban jun­gle in the famous Tra­bi! You get to dri­ve the most icon­ic car of the for­mer GDR: an orig­i­nal and straight­for­ward dri­ving adven­ture, as you have nev­er expe­ri­enced it before. Dis­cov­er Berlin’s gor­geous archi­tec­ture and its unique his­tor­i­cal past. Led by our spe­cialised and pas­sion­ate guides we will take you on a Tra­bi City­tour! You start your tour in the heart of East Berlin. 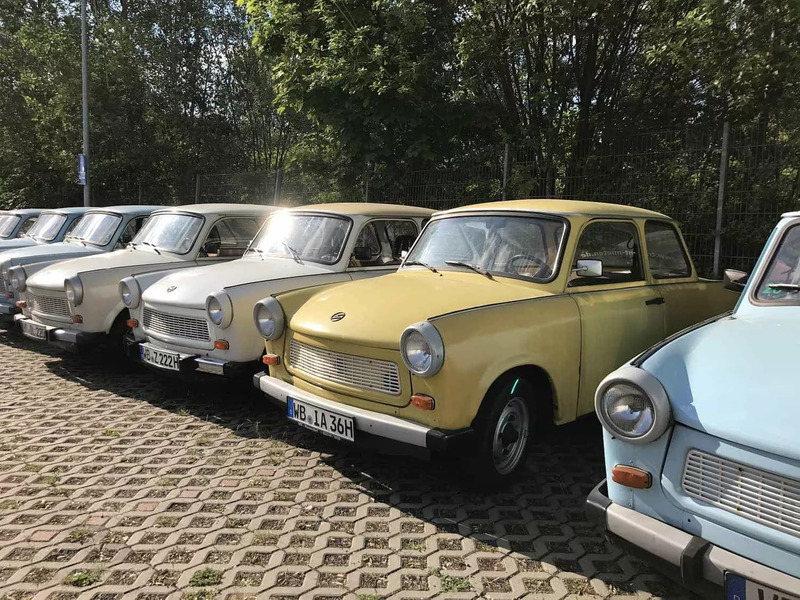 After a short intro­duc­tion to the Tra­bant car, you will dri­ve and fol­low our guide in a con­voy for a 120-min­utes sight­see­ing tour along the sights of Berlin. All cars are equipped with radio equip­ment. Dur­ing the tour, you will get infor­ma­tion about all major sights of Berlin. Explore the Berlin Wall, Check­point Char­lie, Bran­den­burg Gate, Reich­stag and many more. This is our most pop­u­lar sight­see­ing tour. Before you can start the engine, we will intro­duce you to the secrets of the Tra­bant. 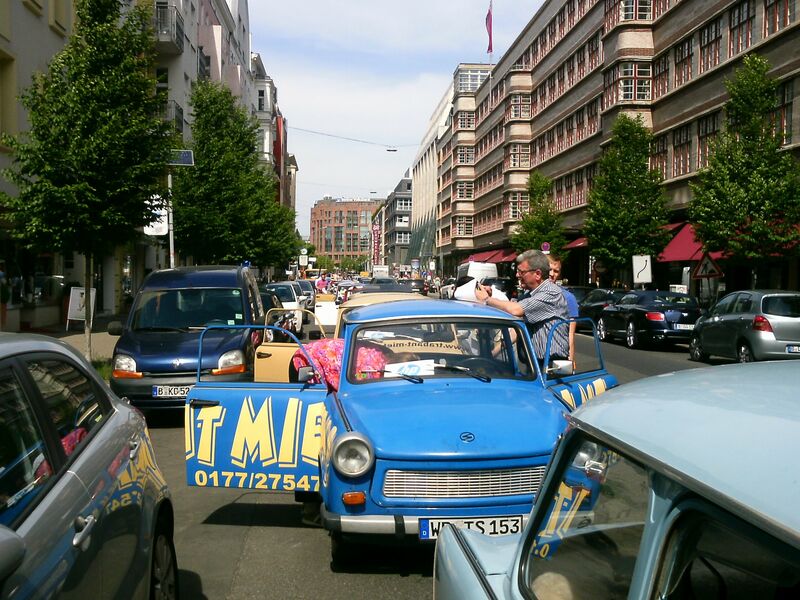 If you have mas­tered the steer­ing col­umn gear stick and the fuel tap, you are ready for an unfor­get­table Berlin sight­see­ing tour! Togeth­er with our tour guide, you will dri­ve along the major sights in a Tra­bi con­voy. We will show you the Berlin high­lights such as the Check­point Char­lie, the Berlin Wall, the Bran­den­burg Gate, the Siegessäule and many more. An orig­i­nal Tra­bi City­tour also includes sights far off the beat­en tourist paths. The recent (social­ist) Ger­man his­to­ry is par­tic­u­lar­ly vivid in the East of Berlin. Togeth­er, we want to dis­cov­er the for­mer Stasi head­quar­ters, the grand boule­vards and the typ­i­cal social­ist archi­tec­ture of the GDR. 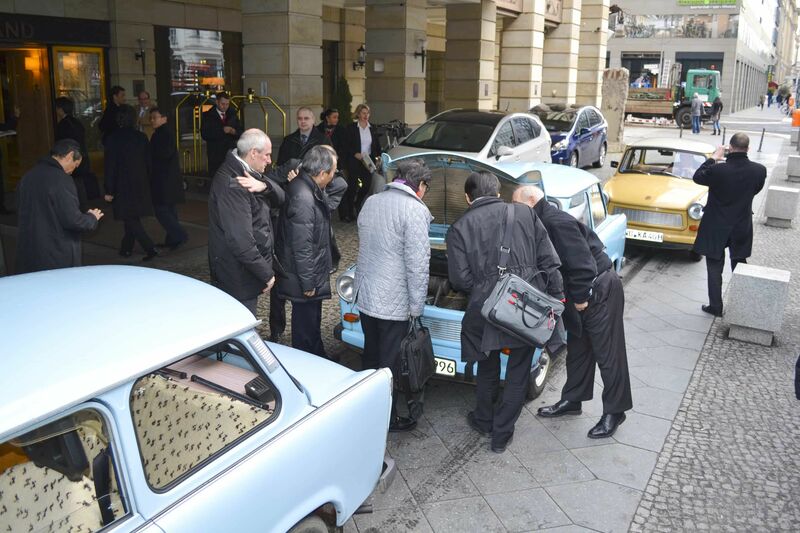 By means of pro­fes­sion­al radio tech­nol­o­gy in every Tra­bant, all pas­sen­gers can fol­low the inter­est­ing and excit­ing infor­ma­tion about the sights of Berlin and enjoy this unique city sight­see­ing trip. The Tra­bi City­tour is our most pop­u­lar tour. You will prob­a­bly tell your grand­chil­dren about it! We organ­ise your Tra­bi City­tour accord­ing to your wish­es and require­ments. Ser­vices also include sup­port dur­ing the event. In the con­text of our inter­na­tion­al sales meet­ing we booked a Tra­bant tour for our team. It was tremen­dous fun and every par­tic­i­pant was thrilled. I nev­er expe­ri­enced such a suc­cess for a team-build­ing event. Bril­liant! Top organ­i­sa­tion!